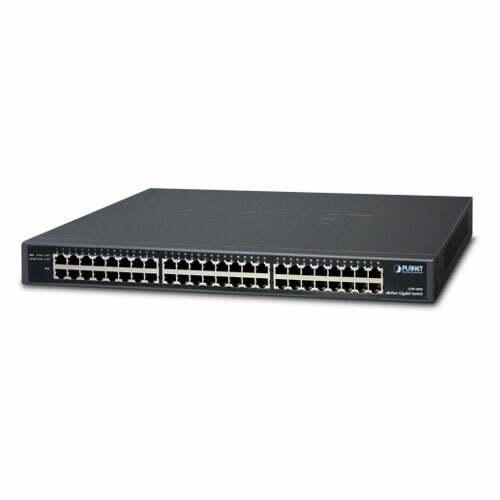 PLANET GSW-4800 Gigabit Ethernet Switch provides 48 RJ45 10/100/1000Mbps ports for high-speed network connectivity. 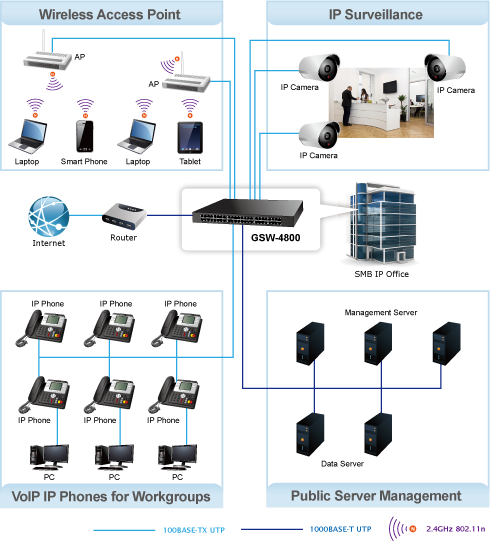 It can automatically identify and determine the correct transmission speed and half/full duplex mode of the attached devices with its 48 Gigabit ports that support 10K jumbo frame feature. 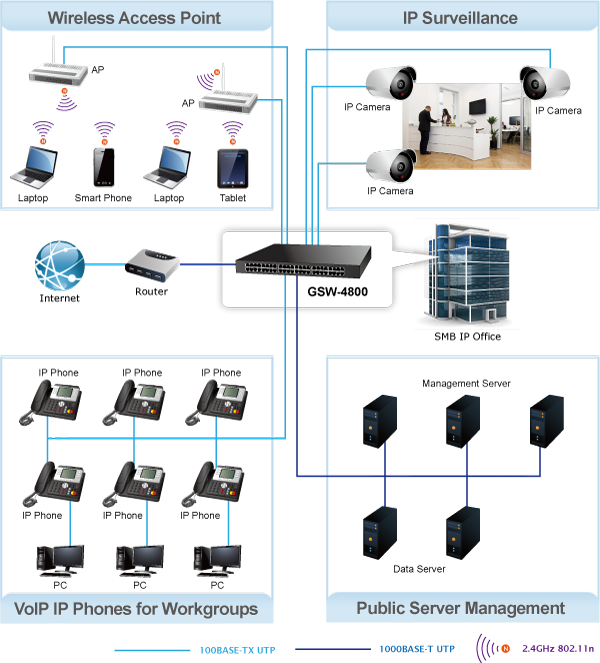 Therefore, the GSW-4800 can handle an extremely large amount of data transmission in a secure topology linking to a backbone or high-power servers. 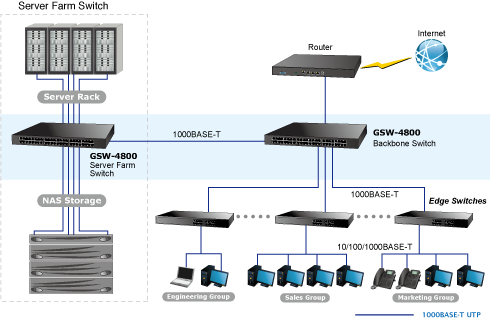 The GSW-4800 provides a high-performance switch architecture that is capable of providing the non-blocking switch fabric and wire-speed throughput as high as 96Gbps, which greatly simplifies the tasks of upgrading the LAN for catering to increasing bandwidth demands. All RJ45 copper interfaces in the GSW-4800 support 10/100/1000Mbps auto-negotiation for optimal speed detection through RJ45 Category 6, 5 or 5e cables. It also supports auto-MDI/MDI-X that can detect the type of connection to any Ethernet device without requiring special straight-through or crossover cables. The GSW-4800 supports a Store-and-Forward forwarding scheme to ensure low latency and high data integrity, which eliminates unnecessary traffic and relieves congestion on critical network paths. With an intelligent address recognition algorithm, the GSW-4800 recognizes up to 16K different MAC addresses. The high data throughput and 96Gbps internal switching fabric make it ideal for most Gigabit network environments, especially helpful for upgrading network to a Gigabit environment. The GSW-4800 successfully reduces substantial power consumption with the fanless and noiseless design collocating with the effective cooler. Therefore, the GSW-4800 is able to operate stably and quietly in any environment without affecting its performance. With up to 96 Gigabits per second of non-blocking switch fabric, the GSW-4800 can easily provide high bandwidth for both today’s and future requirements. Providing 48 Gigabit Ethernet ports, the GSW-4800 is ideal to be used as a server farm switch connecting to your servers and powerful desktops.